Hello everyone and happy 4th of July to all American members. I managed to publish my first ebook on Lulu yesterday, but as with many first time authors, I have a couple of questions. 1. You'll see that the 'marketing image' has black vertical bars on the right and left of the actual illustration I'm using for the cover. When at the stage of uploading an image, the system is first asking me to choose a template of 5 different colours. I chose black, but then when I upload the actual image it appears it does not actually cover the whole template, only a portion of it. Is there any way to remove the black template afterwards, or does that mean I will need to upload an image that covers the whole template? 2. The book comes in two languages, but Lulu will obviously not review the foreign language version, and as a result will not release it on other platforms. I am considering selling both language versions on Amazon Kindle myself, but I am wondering if I will need to assign two different ISBNs for the Amazon Kindle versions. For reference, I own my ISBNs and I am the publisher of the books. I've used two different ISBNs currently for these books on Lulu due to them releasing on two different languages. But will I need to assign two new ISBNs to these same books if I try to sell them on Amazon Kindle, or can I use the same ISBNs because I am the publisher and they will be the same books on there too? These are my questions for now. On top of the above questions, I also want to know what happens if I decide to release a paperback through Amazon's service. I know I will need to use two brand new ISBNs, and that's fine, but will there be a problem with Lulu? There was an ISBN FAQ topic I had browsed a few months ago on here which was a bit confusing when it came to ISBN usage. Hey, Legeon. Happy 4rth to you and to all American lulu users! I will answer shorthand bec it's too hot here in the north. Do English ebook for lulu. Other language ebook at Streetlib. Print. Three different print bindings, two at lulu, perfect and hardcover, plus a third, different size/binding at CS/Amazon. So, you have 5 books so far. You need 5 ISBNs. Get distribution for all 5. I hope I answered all your questions. If not, ask again. PS. The only thing I haven't done from the above is a foreign language ebook. But I know for a fact it's straightforward at ST. Thanks for your answer, I understand what you mean - you only chose to answer the ISBN part, and that's fair. However I think you did not really answer my actual question, because you gave me one release per distributor and that's not what I was asking. Of course I would need different ISBNs then. I have released the ebook versions (of both languages) on Lulu right now, and I am waiting for the reviews, in order to commence distribution of the English version on all platforms except for Amazon Kindle, which I have left inactive on purpose. Lulu will not review the Greek version because they just don't review foreign language books, and as a result will not distribute it anywhere else other than here. Because of this, if I decide to publish both language versions on Amazon Kindle by going straight to Amazon, and not through Lulu, do I use the EXISTING ISBNs I've already assigned to the ebooks on Lulu (because they are the same ebooks, and Lulu would use the same ISBNs if I allowed them to handle the Kindle distribution themselves), or do I need to assign new ISBNs? I am basically worried that the Greek version of the ebook is being held hostage here with an ISBN I will not be able to use again, as Lulu do not review foreign language books and will not distribute it anywhere else. As such it makes sense to handle the Kindle releases for both ebooks myself - but since they are the same ebooks and ISBNs have been assigned already, I need to know if I can use them on another platform for this purpose. You do not need a new ISBN to distribute the same ebook via Kindle. But-- regarding the Greek book, why not try to get it mass distribution? 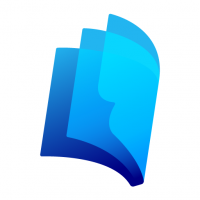 Streetlib is expanding and distributing in new languages weekly. Tomorrow, Paul will be back and supplement any information I have missed. Kalinichta kai kali tichi me to biblio sou. Thanks for the answer Em_Press, I'll wait for some more info from Paul then. 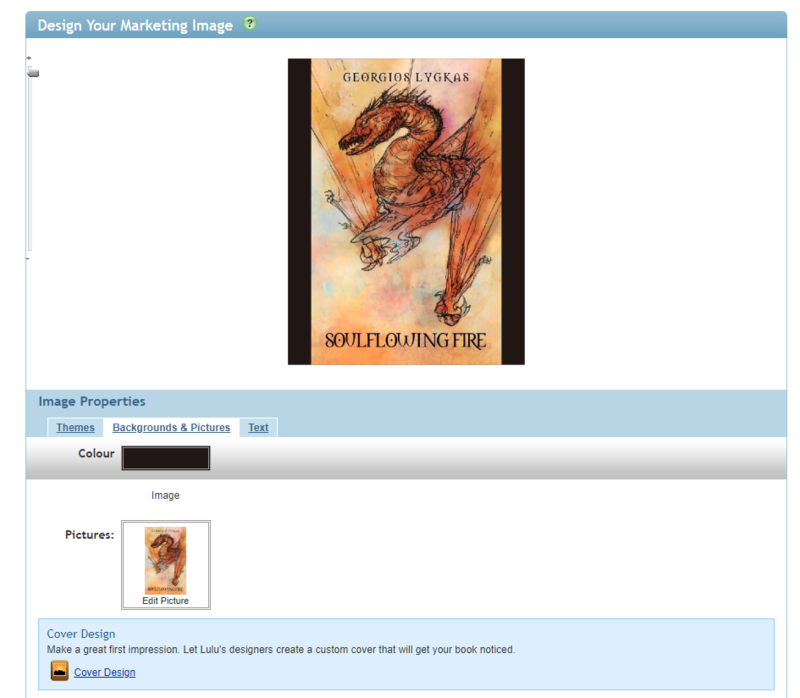 For the ebook cover, I'm not actually certain how we managed to overlay the marketing image you uploaded with the template background. The image you uploaded should have overwritten any template you selected, and if it wasn't sized correctly, you should have received a notification to resize and upload again. This might be a question for our support team to field, so they can get into your files and review exactly what happened. As for the Greek ISBN, that too might want to get reviewed by our support team. I'm honestly not sure how it works with non-English ebooks since we can't put them through distribution, so the ISBN shouldn't be "bound" to the ebook. Unfortunately, our expert on the matter is out for the US holiday and I don't believe will be back until the start of next week. But it is problem worth opening a support ticket to check up on both of these questions. Thanks for information Paul. I'll be raising a ticket with the support team to figure out what is going on and will post here too in case I need more help. So my ebook submissions have been rejected twice due to incomplete Table of Contents etc. I will be spending most of the day tomorrow trying to piece together whatever I can from 4-5 different Lulu URLs regarding top 10 reasons why my ebook was rejected, an ebook creator guide, ebook distribution requirements, ncx preparation, etc. The second reason my ebooks were rejected where the covers due to the black bars - they're now white because I re-uploaded the covers and changed the colour, but they are still there. I cannot, for the life of me, figure out what I am doing wrong. I am uploading the files with the exact specifications that are requested, 72p and the certain number of pixels for width and length. The bars on the left and right side of the illustration ARE ALWAYS THERE. I have opened a ticket for it, but have not heard back since. Another ticket I opened was regarding the ISBN usage, someone replied to tell me I cannot use the ISBN of the Greek ebook to distribute anywhere else. Lulu will happily use the ISBN of the English ebook to distribute everywhere else however. I have replied to her, I suspect she did not understand what I was asking. These processes and glitches are making this harder than it should be. So my ebook submissions have been rejected twice due to incomplete Table of Contents etc. How are you preparing for the TOC? Whatever you wish to be in the TOC should have Heading Style 1 applied to it. Note that to get through the TOC rejections you only need to apply HS1 to the Title, and the word Copyright on the copyright 'page.' That's the basic minimum. I will be spending most of the day tomorrow trying to piece together whatever I can from 4-5 different Lulu URLs regarding top 10 reasons why my ebook was rejected, an ebook creator guide, ebook distribution requirements, ncx preparation, etc. I ignore that and upload images of at least 300DPI, and the Wizard handles them OK. I also always use jpgs. for width and length. The bars on the left and right side of the illustration ARE ALWAYS THERE. I have opened a ticket for it, but have not heard back since. Another ticket I opened was regarding the ISBN usage, someone replied to tell me I cannot use the ISBN of the Greek ebook to distribute anywhere else. Well if you have already used it here (or it belongs to Lulu anyway) then you cannot. ISBNs contain a lot of information, and one is the original source. Lulu will happily use the ISBN of the English ebook to distribute everywhere else however. I have replied to her, I suspect she did not understand what I was asking. Only if you do not understand what an ISBN is, nor fully digest Lulu's pre-ePub guidelines. I'll discuss the ISBN issue later (for reference, I'm not using Lulu's ISBNs, I own all of my ISBNs and that's why it's an issue for me), and I think I understand what I am doing wrong with the TOC, so I'll come back to this later too. But here's the issue with the cover. 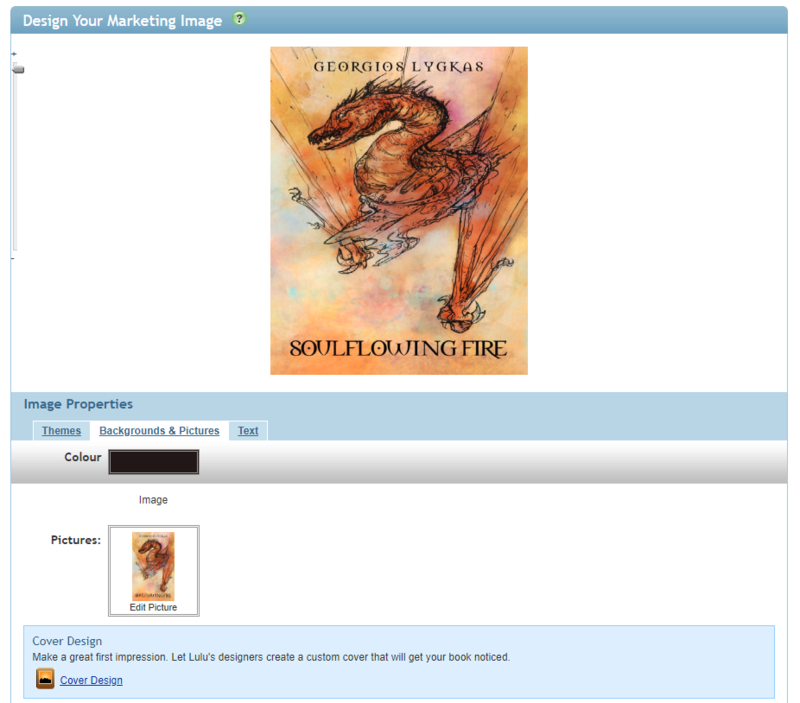 This is what I am getting when I upload my cover/thumbnail on Lulu during the 'design your marketing image' stage. It's as if the picture does not cover the whole area. I've resized it to Lulu specs 3-4 times (at least 72dpi, 612 pixels wide and 792 pixels tall, but I am still getting the black bars. If I change the colour, the colour of the bars also changes (it's the background, so my cover obviously does not cover the whole area). The only way to solve this is to click on the option to stretch the picture to fit the available area, but then it looks like this ugly mess. Any ideas what I should be doing to get past this stage? There's something wrong with the aspect ratio, isn't there? I've been fiddling with an image resizer and only if I change it the aspect ratio do the black bars disappear. Do as I do? 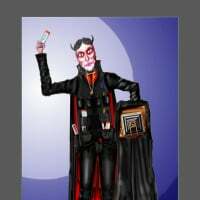 Just in case my 'full sized' images do not fit the Wizard's built in template (they usually do, though) I always pre-colour the background to complement the outer edges of my image. Do you do as I suggested though? 300dpi and a jpg? It does look like a ratio issue. It might be that the image (the original image) needs to be exported from your image editor again with the thumbnail specs matching and the ratios set from there to be sure it fits perfectly. Hey Paul, when it comes to creating the TOC, how can I add the cover in the TOC? Right now if I add the cover in the first page, the TOC shows a dash symbol as the first entry, and this will most likely lead to a rejection. If I choose the picture and style it as Heading 1, the dash is still there. Can I somehow give a name to the image of the cover inside the file (like "cover") in order for it to appear as "cover" in the TOC? Or does it only have to be a piece of text styled as Heading 1? I forgot to say, I work on a .docx file. Would I need a particular piece of software to do this? I don't understand why you want the cover image in the TOC. The cover is uploaded separately from the source file. Customers will receive the ebook with the cover, so don't worry about it. Ebooks will only be generated if the source document is correctly formatted. This means the title of the book must be the very first line of the manuscript. There should be no page numbers or manual table of contents in your document as the TOC will be automatically generated and there are no pages in ebooks. At the very least the title of the book should be allocated a Heading 1 style (chapter headings can also be allocated H1 or H2 styles if you wish) and that is pretty much it. Legeon, the cover stretching issue can't be helped. Just ignore it even though it is frustrating. Upload 300 dpi 6x9. Regarding the TOC, you can generate TOC and then edit TOC using Sigil. Generate TOC after every change so you do not get "errors." Use shift return to move title down. Or, since it's a novel, you can use H1 for title and H2 for chapter headings, that way they can have different formatting. It sounds complicated because it's new to you, but it's not. Live with the cover, use H1 and H2. That's all. Message me if you need help. Send me epub generated by Lulu. EM hits it on the head. It is possible to include the cover as an entry and the easiest way to do so is to use Sigil or Calibre to edit the EPUB itself. I just had an idea regarding the cover stretching. Prepare an image in Photoshop. Your cover as is, drop shadow, white square background. That way it looks like it is indeed a marketing image prepared for the web page by the retailer. So, to reiterate, white square background, say, 9x9, place your 6x9 layer on it, add drop shadow to 6x9, save as jpeg 300 dpi RGB, upload. Actually, make background taller so drop shadow shows all around. Thanks for all your help everyone, everything has been sorted out according to your advice. Next are the hardcovers, but if I need to, I will open a topic there once I receive them. Hello again, one last question which Paul should be able to answer. What does the 'everything else' mean alongside the Kobo distribution option? Is Google Play Store included? Unfortunately, we don't make that list public at this time. The reason being that the variety of retailers we submit ebooks too during the distribution process can always opt in or out as they see fit, meaning very few ebooks will hit the entire list. As far as I'm aware, we send ebooks to all major ebook distributors. That's a good answer. I didn't know that.